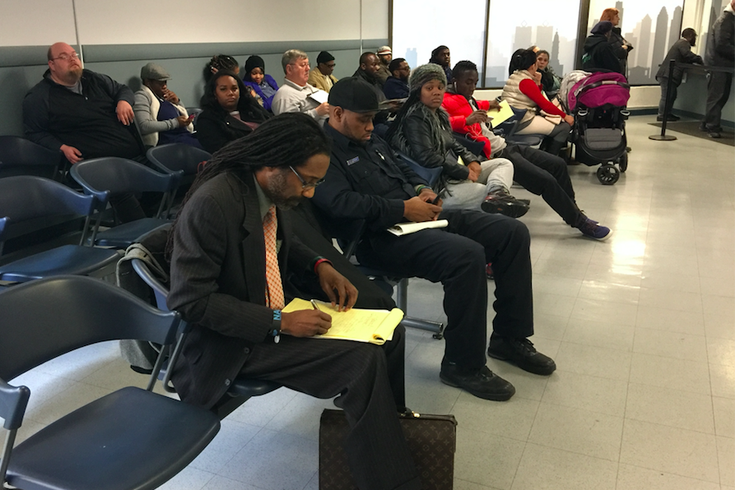 Michael Coard went to the Philadelphia Parking Authority's Board of Administrative Adjudication on Thursday, January 26, 2017 to both fight a ticket and rally troops in his ongoing legal fight against the agency. As thousands of protesters descended upon Center City on Thursday to rally outside the Republican House Senate Leadership Conference, attorney Michael Coard was wrapping up a pretrial conference inside the Criminal Justice Center. His client, Carlton Hipps, stands accused of killing Philadelphia police Officer Robert Wilson III during a 2015 robbery at the since-closed GameStop location at 21st Street and Lehigh Avenue in North Philadelphia. It’s a death penalty case. They were ironing out some lingering issues before trial. Around 12:30 p.m. – as protesters awaited the arrival of President Donald Trump’s motorcade – Coard left the courthouse for an act of defiance of his own. Coard, a boisterous criminal defense attorney, walked four blocks east along Filbert Street toward the Philadelphia Parking Authority’s Bureau of Administrative Adjudication. Eight weeks to the day after he set up shop outside the PPA with a megaphone to declare that war, he was successful on both fronts. With pictures clearly showing his car wasn’t in a bike lane, or on the wrong side of a “No Parking” sign, his ticket was dismissed within five minutes. That was more of an afterthought, though. As soon as he got into the waiting area with about 20 other ticket-fighters before his hearing, he stood at the front of the room and declared his intentions, with a stack of “Legal Strategies to Fight PPA Tickets” in hand. “My name is Michael Coard. I am an attorney here fighting a bulls*** ticket, too,” he bellowed. That was all he got out before a female voice emanated from behind the door leading back to the hearing rooms. “Sir, sir, sir,” it started. You cannot do this, was the message, one reiterated by the guy manning the metal detector near the front door. After some private consultation, Coard returned to the room, abiding by their request that he not stand in the front of the room or yell. So, he just sat in a chair and continued. “About six months ago, I got a ticket and lost here, and filed an appeal,” he noted of the case he spoke about outside in December. “I lost on this level, but most people can’t appeal to the Common Pleas Court. It costs $200. People are not gonna do it. I did it, and won. Based on that victory, the Parking Authority could owe citizens between $10 and $20 million in refunds." That was all many of his fellow ticket fighters needed to hear before walking over to Coard to get his flyer, its information typed under the “PHILLY! Philadelphians Hate Inquisitional Larcenous Losers, Yo!” banner. “You can take five. Pass them around,” he said to one woman who approached. In the grand scheme of all things going on in Center City on Thursday, it was a minor act of defiance, this reaching out to other people cited by PPA while officials there preferred he didn’t. “I know who you are,” the PPA employee he spoke with after the initial disruption told him, Coard said. To Coard, though, the act was a way to keep the mission he said would carry on after that December event was still moving forward. When asked about that incident, a PPA spokesman focused all comments onto the merits of his case. Those merits are still the focus of an ongoing legal battle, and impact the timing of Coard’s next move in this war. While he’d hoped to convene a public meeting for citizens to gather and plot a course forward against the PPA by mid- to late-January, the appeals process has pushed that back.